An ex-'60s radical now working as a private eye is hired by an old flame to investigate a political smear campaign. The case becomes more dangerous as it unfolds. A grumpy semi-retired private investigator partners with a quirky female client to catch the people who murdered his partner. In the West Berlin of the 1960s, two British agents are killed by a Nazi group, prompting British Intelligence to dispatch agent Quiller to investigate. A dedicated schoolteacher spends her nights cruising bars, looking for abusive men with whom she can engage in progressively violent sexual encounters. An imprisoned rogue USAF general with a secret personal agenda, escapes the brig and takes over an ICBM silo, threatening to start WW3. Fritz Weaver ... Oscar Procari Sr.
Moses Wine: Bakunin? Bakunin was a terrorist monster. You are not an authority on Bakunin just because you used to date every terrorist in Soviet Russia, that does not make you an authority. 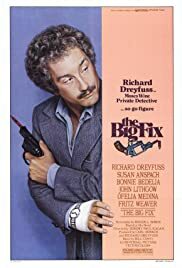 The Big Fix is a mystery that does not answer every question that it raises, but it nails the Zeitgeist of the late 60's from a vantage point 10 years later. I have only seen it once, when it first came out and I have looked for it ever since. The story is slow to develop with Moses Wine (Dreyfuss) having trouble with seemingly every aspect of his life. We learn that he feels displaced in time, and cannot get past the radical time in his life. I and many others have had those same feelings in the 35+ years since. The sense of confusion and struggle fits exactly the feelings many of us experienced at the time. Taught to respect the police by our Greatest Generation parents, we often found that we were at the top of the police list of suspects for anything from subversion to bad manners and bad dress. The sense of alienation that I felt at the time permeates the viewing. I may have read too much of myself into it; if so, The Big Fix evoked it from my own life. Leon Redbone's "I Wanna Be Seduced" while Moses gets ready for a date with Lila Shay (Anspach). Moses at the TV station reviewing scenes of past demonstrations; the images are shown projected on his face. No real detail is visible except the tears on his cheeks. Powerful. The reunion of old friends as they dance around the swimming pool of the house that was built by selling out the old radical values. Finally, a sense of something incomplete at the end. The mystery solved, but every question not answered. How true to life! 20 of 23 people found this review helpful. Was this review helpful to you?